Wildlife Management Services cater our services to suit the intricacies of many different industries. We have been delivering services to the sports stadiums for at least ten years. 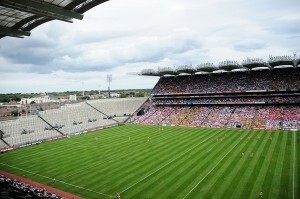 Sports stadiums, such as GAA/football pitches, rugby grounds, greyhound stadiums, racetracks are large open areas located next to or near urban centres. By design the stadiums provide a host of nesting and roosting areas for birds with the nearby urban centres offering a constant food source for birds. Generally the main species causing problems would be pigeons. Sea gulls can also cause problems in coastal areas particularly after matches and events where it is not always possible to immediately securely clean-up food waste from attendees. Bird droppings cause’s health and safety hazards. Fouling in areas such as seating and walkways can smell unpleasant appear unsightly and can deter customers. Although it is possible to clean this, it is costly and will need to be carried out very regularly. Droppings can cause a slip hazard, even with daily cleaning, pavements and walkways are only safe for a short while before the droppings accumulate again. Furthermore when there is food production on site bird droppings cause an additional hazard by carrying disease organisms such as Salmonella, Escherichia coli, Campylobacter jejuni, Lysteria monocytogenes, Vibrio cholera. Birds can also pull waste bins and rubbish open which would leave the place looking untidy and incur further clean-up costs.